The final polls for May are in, bringing the total number to 87. As in previous instances of this analysis, the bulk of the data comes from Emnid, Forsa, and INSA. As always, it would be great to have more data from the other companies to play with. The Schulz boost is over, yes? 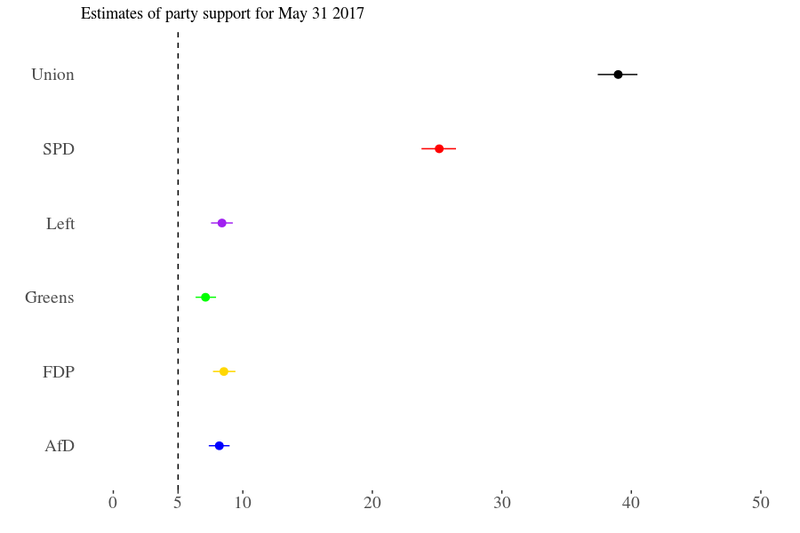 For the two major parties, May has confirmed a trend that began in April: the Christian Democrats are regaining support at an almost constant rate, whereas the Social Democrats are losing support in similar proportions. 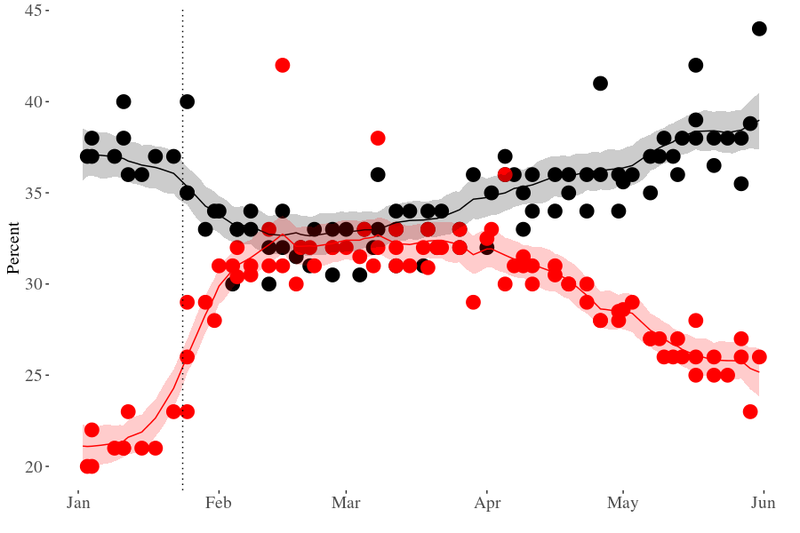 Both parties are more or less back where they started in January, before Schulz’s candidacy was announced. Incidentally, that is roughly where they were four years ago at the same time in the electoral cycle. Any surprise replacement for the unpopular Sigmar Gabriel would have been a clever move. Presenting a new figure energised the party and created a lot of positive media coverage for the SPD. Schulz was a known unknown in German politics. As former president of the European Parliament, he had a reasonably familiar face. At the same time, no one hat the slightest idea what he stood for in terms of domestic policies. That made him a canvas on which everybody could project their personal image of the perfect challenger. Moreover, his initial assessment was largely based on personality, which allowed him to benefit from Merkel fatigue (TM). But … Schulz disappeared for weeks, he failed to explain what would make him a better chancellor than Merkel, his trade mark issue of “social justice” is popular in Germany but not really divisive given the socialdemocratisation of the CDU under Merkel, and Schulz was also implicitly blamed for the string of lost Land elections. Sad. Loser (for the time being). This is a very boring picture. 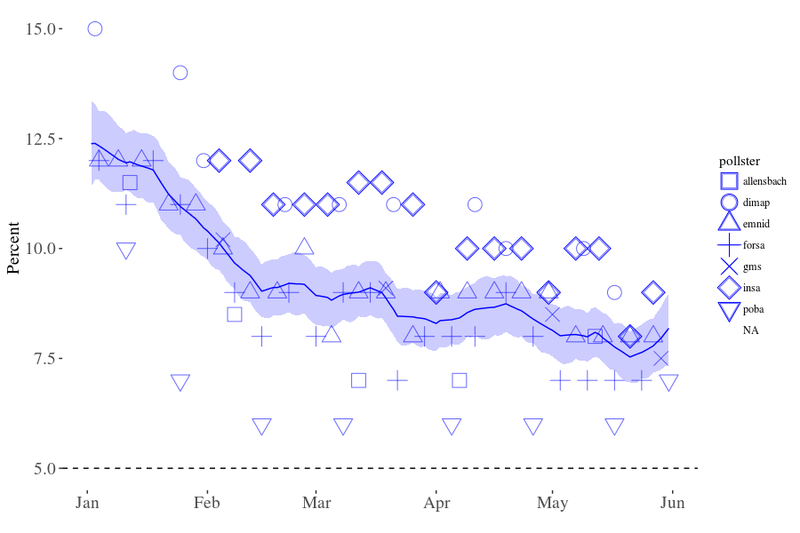 While the two major parties are battling, the far-left and the far-right party have been mostly stable and neck-and-neck in the polls since mid-March. 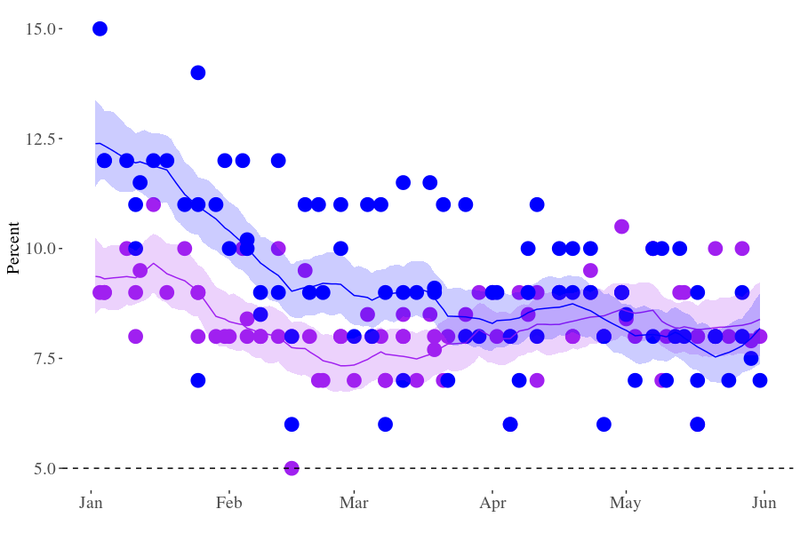 Truth to be told, there is a lot of movement in the polls, particularly for the AfD, which in May was put anywhere between 6 and 10 per cent. But the model believes that this is a combination of noise and house effects, and that the true level of support has hardly changed. With respect to the AfD, INSA remains the most bullish and FGW remains the most bearish house. But even for INSA, there is some variation (8 to 10 per cent), whereas Forsa sees the AfD as absolutely stable at 7 per cent. The FDP is back. Or is it? 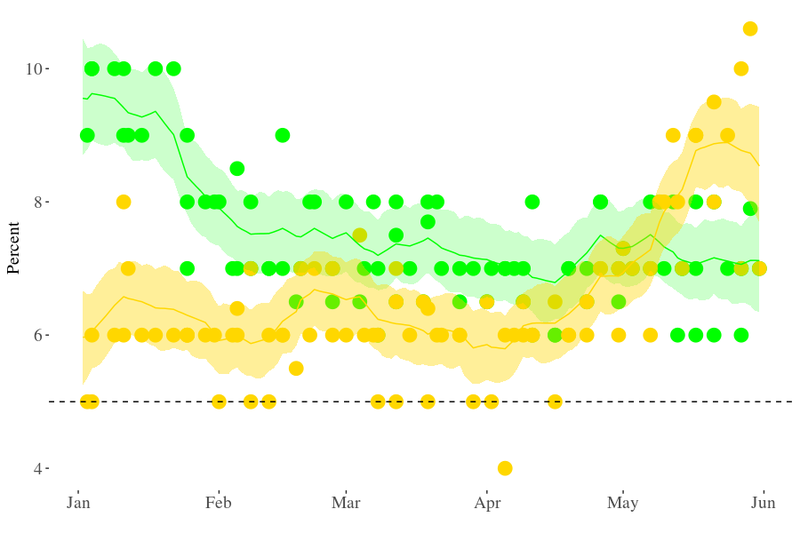 Both the Greens and the FDP have been stable for months, with the latter positioned in many survey too close for comfort to the electoral threshold. But support for the FDP (who in 2013 lost representation in the Bundestag for the first time since 1949) has risen in May, allowing them to overtake the Greens for the first time since the campaign began in January. This reflects their good performances in the latest Land elections. However, it is difficult to tell whether they really have a lead over the Greens. Polls for both parties vary quite a bit, and so the model gives them wide-ish credible intervals and suggests that the gap between the two is already closing again. On current polling, six (or seven, if the two Christian Democratic parties are counted separately) parties would enter parliament. All four minor parties are well above the electoral threshold of five per cent, and statistically indistinguishable from each other. Between the two major parties, there is a very visible gap whose credible interval is 11 to 16 per cent. There are still three months to go, and polls are not predictions, but the Schulz effect would have to return with a vengeance to close this distance. In a renewed Grand Coalition, the SPD is likely to be the junior partner. But could Schulz still be chancellor by ganging up with smaller parties against Merkel? Again, this is not a prediction, but on the basis of the polls, it seems unlikely. In 60,000 simulated draws from the estimated distribution of political support, not one shows a majority for a red-green coalition. The same goes for a red-red-green majority, even if that was politically viable (a question the SPD will not dignify with an answer), and for a “Traffic Light” (SPD, FDP, Greens) coalition. For the last year or so, I had alway assumed that the AfD’s likely entry into the Bundestag would deprive a would-be centre-right government of their majority. But the remarkable rise of both the Christian Democrats and the FDP suggests that there might be a chance for a traditional black-and-yellow coalition: In 19 per cent of the simulations the two parties achieve a (bare) majority necessary to form a government. And rather intriguingly, in all 60,000 simulations there is a majority for the still somewhat exotic “Jamaica” coalition (Christian Democrats, FDP, Greens). And of course, both major parties together would always command a majority of at least 60 per cent. Put differently, given the current state of the polls, it would be impossible to form a coalition without the Christian Democrats. Which in turn means that the initials of the next chancellor would inevitably be AM.